Removing the retaining bracket and the access cover reveals the high voltage section and the three main relays. 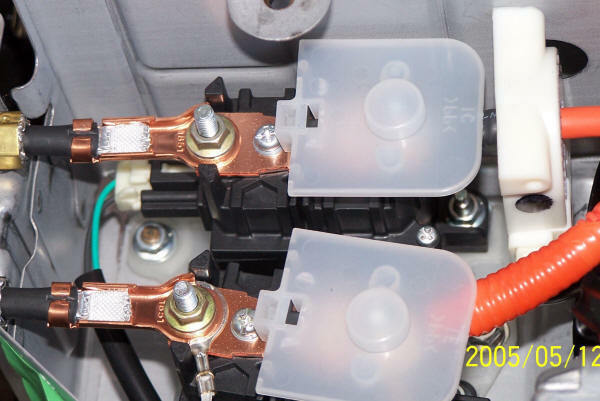 The two relays on top connect the orange battery wires (right) to the orange inverter connection wires (left). 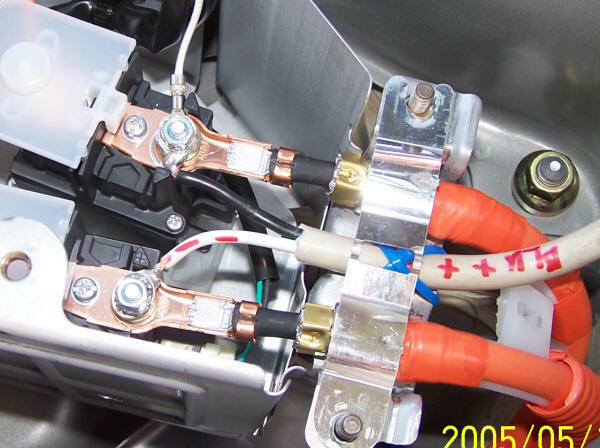 Note the plastic tabs on the right side of the two relays which prevent exposure to the battery connections. These are "live" whenever the service plug is in even if the relays aren't energized. To connect to the HV system, we are going to piggyback an outlet strip on the two relay terminals. 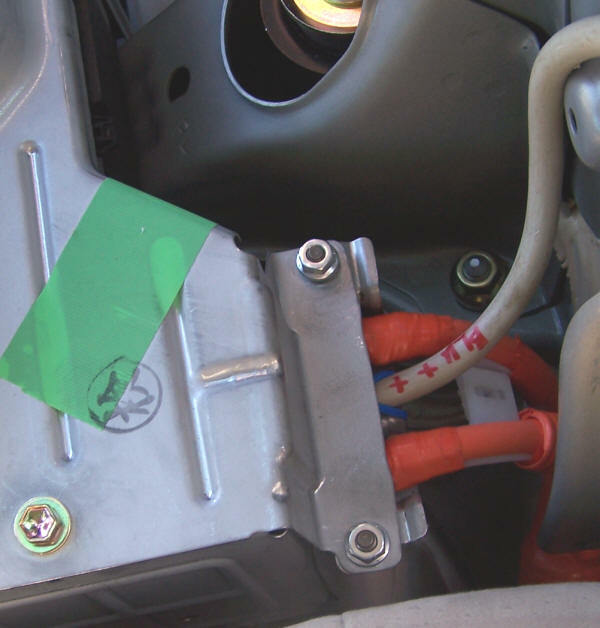 Because the torque is critical on the already-existing fastening, it's best to add an additional washer, wire, washer, and nut on top of the existing assembly. The deed is done. Black wire goes to positive terminal, white wire to negative. Tie wraps (blue) used as strain relief, and wire brought out in same manner as the orange cables to the inverter. HV access cover reinstalled, new wire routed away from sharp edges. The completed connection. We now have the world's only Prius with a 220V DC outlet strip. Note that the outlet strip has the polarity labeled and is tagged "No Surge Suppression." The surge suppression components were removed because this is a 115V outlet strip. It was probably an unnecessary precaution because the peak voltage of a 115VAC signal actually exceeds the HV battery voltage by a significant margin. For the same reason there is no problem using a 115VAC rated outlet strip on 230VDC. At this point, the Prius can be driven again, since the battery is fully protected and secured, and the only components missing are cosmetic, not structural.